So looks like all C40s are getting Version 2. I wonder when they're gonna install screens on the 2015 XD40s. Do yall think the Orion VIIs Diesels are gonna get the screens? Those are 2011 models too. 193 and 592 have version 2 screens as well. They probably will once they get some more C40s done. Are they ever going to fix those screens on the s79? Whats up man. Can this thread get pinned? I feel that we should have an official roster on the first page for buses with the screens and the scren types. It’s not really a priority because those buses are on their way out soon so they will get to them during the maintenance rotation. Let me review what is already pinned, and go from there. To answer your other question, everything 2010 and newer is supposed to get the screens. NO WHY...version 3 is awful. Does it have the same screen placement as the other XD40s? Since this would be the first XD40 with version 3. Same placement back to back, but there's an unnecessarily big gap between the two like the front sign on an XN40 because of that stupid metal bar in the back. Negative. 7256 has it also. The back sign is completely blank, the announcements lag and some of the transfers are just plain wrong. Version 3 is garbage....should've went with Version 2 and Version 4 smh. Seeing these on LFS’s, they’re not visible from the back because the second screen is so close to the first. And I get that the second couldn’t go over the rear-most Stop Requested light because of the AC vents...but a LED bar at the rear door - like BeeLine buses - would’ve been more useful. Its not because of the AC vents because that's the location of the screens on the newer LFS buses coming in. It's because of the stupid stop requested light in the rear. Version 2 seems to work good with Limited and SBS routes. Seems too delayed to be for local use. If the contract is split, would've been nice to give V2 to buses that are gonna be used strictly for SBS. Such as the XN60s, the new LFSAs, ENYs XD40s and the next order of XD60s for SBS use. Local buses should've received Version 4 because it responds quicker for stops that have a shorter distance. Honestly they should've gone with Version 4 all along because it would've been perfect for all bus models. For the XD40s, you could've position them like the C40LFs, for XD60s/XN60s you can position the first small screen right behind the driver, the second right after the middle door on the ceiling, and the third right before the middle door on the ceiling. For the LFS would've had two wide screens positioned just how they are now. 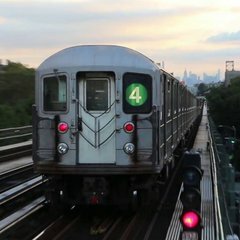 Just my two cents, I feel like nothing gets thought through with the MTA. Just do and keep it moving. Who decides on the types of screens and the placement of the screens in the buses? Is it one person or a group of people? That's a good way to sum it up. Kinda like moving fast and breaking things. A small number of these units (^) do not have screens installed and will be installed at a later date. If anyone knows which units don't have screen please post the number below. These units (*) may feature an older version. I'm sorry 592 has version 4. My mistake. Not sure if this was mentioned, but when an Orion pops up on the M79/86 SBS, the announcements tend to go haywire, saying "UNDERSCORE UNDERSCORE 2 UNDERSCORE".